Shooting on the move is more of a controversial topic than you may think. For some people, shooting on the move throws their accuracy and safety off so much that it’s not a good idea. For other people, they have to move so slow to be able to make hits that it makes more sense to run to where you’re going and then draw and shoot. But you can move fast and shoot accurately at the same time. It’s important to remember that there’s two components to moving and shooting. There’s the skill component and there’s the tactical component. This video covers the skill component. The tactical component can be debated ad nauseam and is something you need to cover after you build the skill set. 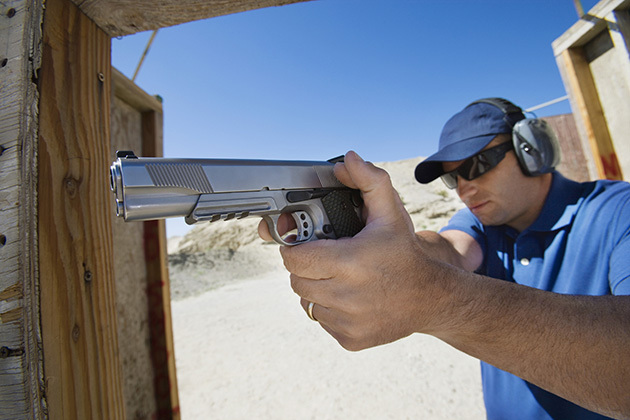 Regardless of whether or not you believe there is a tactical application, there is an accelerated learning benefit to executing the fundamentals of marksmanship on the move. In short, it’s like a turbocharger for improving your fundamentals. Once you’ve got your fundamentals dialed in and can consistently shoot well in sterile conditions (stationary, well lit, low stress) then learning to execute the fundamentals on the move will help you create up to an additional 1.9 million neural connections per second. That’s a huge deal and it can help you blast through plateaus in performance. Now, just like a turbo on a car…you want to add movement drills to solid form. Adding movement to mediocre form is like adding a turbo to a rusted out ‘72 Pinto…don’t do it. The end result will just be a lot of wasted ammo. But, once you’ve got solid form, you want to start adding in motion…first straight forward and straight back. Then side to side. Then angles. And eventually, you’ll be able to move close to full speed and still make solid hits on targets…like in the video. You can do this drill with dry fire, with a Dry Fire Pistol, with an airsoft gun, pellet gun, UTM gun (what I’m using in the video), or live fire with your real steel. The important thing with moving and shooting is to figure out your performance envelope. Know how the speed that you’re moving will affect the size of the groups that you’re able to shoot. And then take consistent steps to get better…faster and faster movement while shooting faster and tighter groups. First, you start by mastering the fundamentals. You get really good at running the gun in sterile conditions. Then you slowly add in movement, and then you speed up the movement.